For the past two years AFSCME 3299 workers bargained for a fair contract with the UC, but have yet to reach an agreement. 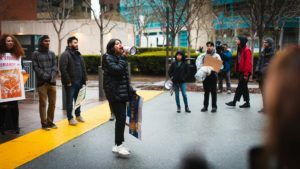 Tired of waiting, about 60 students with the UC Santa Cruz’s Worker Student Solidarity Coalition (WSSC) and AFSCME 3299 gathered Wednesday at UC San Francisco (UCSF) with protest signs in hand. AFSCME intern Citlalli Aparicio recites the demands of the AFSCME workers and the UC students who attended the UC Regents Board Meeting. Photo by Nikolasi Saafi. Inside the building, during the UC regents public comment session, AFSCME 3299 workers and supporters expressed their disappointment in what they perceive to be the regents’ lack of effort in reaching a fair contract. Tobin focused on her personal battles with the UC’s outsourcing issue, delivering a tearful comment during public session. Since month and year AFSCME 3299, the largest UC union representing 24,000 employees, has called the UC to provide workers with a fair contract. Protesters demand UCs provide livable wages and benefits, end ties with immigration agencies and stop job outsourcing, among other grievances. The construction of UC Davis’s new rehabilitation hospital was a particular concern. In association with Kindred Healthcare, UC Davis plans to construct a joint-venture rehabilitation hospital on its downtown Sacramento campus. A majority of ownership and management of daily operations of the hospital will transfer to Kindred, a health care service company based in Louisville, Kentucky. UC Davis claims the hospital will double the capacity to treat the community’s needs and create 200 more jobs. UC Davis medical staff argues this costs UC healthcare workers their current jobs. Although the hospital will be known as the UC Davis Rehabilitation Hospital, the rehabilitation staff at the original hospital will need to reapply through Kindred with no guarantee to retain their positions, or be reassigned to other positions within the original hospital. In the past, UC administration has responded to AFSCME 3299 demonstrations with statements dismissing the demands for higher wages. 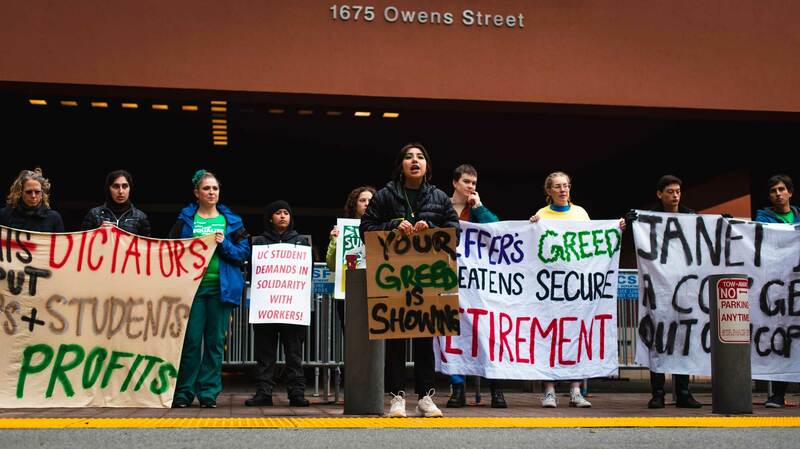 At the end of the public comment session, protesters began a chant, calling out what they believe is the UC’s tendency to value profit over student and worker needs. After several minutes of chanting, police instructed protesters to leave the building for unlawful assembly or face arrest. 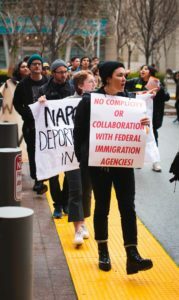 A student in the protest holds a sign that reads, “No complicity or collaboration with federal immigration agencies!” Photo by Nikolasi Saafi. AFSCME has posed the failure of the university to fulfill basic needs as a common thread tying workers and students together. 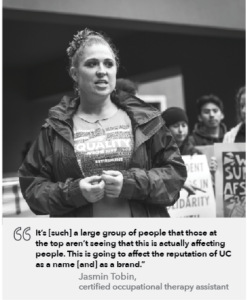 AFSCME 3299 member Jasmine Tobin blamed the bureaucracy of the UC system for its shortcomings on the issue.